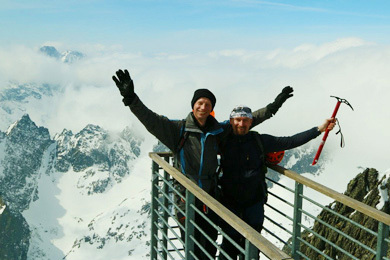 Lomnicky Peak is the second highest peak in High Tatras and one of the most beautiful. Lomnicak is also one of the most visited thanks to spectacular views from its summit of Mala Studena Valley, Five Spis Lakes, Ladovy Peak (Ice Peak), Gerlachovsky Peak, Vysoka, Rysy, and Krivan. Our mountain guides will be happy to take you up Lomnicky Peak as the ascent without a mountain guide is forbiden, except by riding a special gondola from Skalnate Lake. Traditional Lomnicak ascent route goes from Lomnicke Pass over Lomnicka Kopa. The route is secured with chains and other climbing protection. We would ride a gondola from Tatranska Lomnica up to Lomnicke Pass, the climb starts there. On the way down we will descent to Skalnate Lake and ride the gondola down. 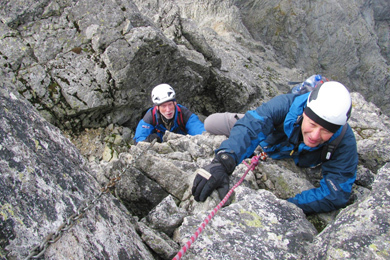 For more experienced mountaineers – we would love to take you up Lomnicak via other more challenging routes such as the ascent from Mala Studena Valley. 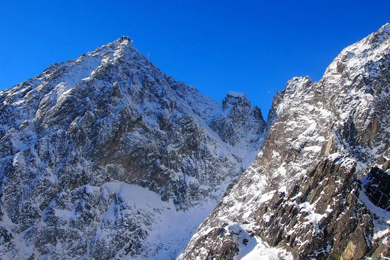 Lomnicak was long considered the highest summit in High Tatras and the locals used to call it “Grand Father” in the past. Very likely, the first person to summit Lomnicak was a famous English traveller and doctor Robert Townson. His ascent went from Mala Studena Valley, leading via Filmarky Colouir, via Lomnicke Pass, and up the today’s standard route. It is very certain that the summit was also reached by Spis gold-diggers who were in search of their fortune in the north couloirs of Lomnicky Peak. And one more piece of history – a shepherd Jakub Fábry worked in the region between 1860 to 1890 and would boast that he climbed to the the summit of “Grand Father”.